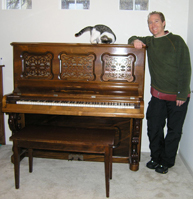 There are various reasons someone needs to move specialty items such as pianos, pool tables, hot tubs, bath tubs, sculptures, safes, large furniture and more. Moving these items can be challenging simply because they are often awkward, large and heavy. When moving such item’s you should really rely on a professional moving company with experience in moving specialty items. Moving specialty and heavy items often require disassembly and/or construction of a custom crate for proper transportation to the new location. At times we find moving these items by yourself can cause bodily injury and more often damage to the item you’re moving. Damage to an item can sometimes cost more than the move itself. With North Bay Movers we’ll handle it all for you, building ramps, creates, disassembly and re-assembly of your items throughout the move. 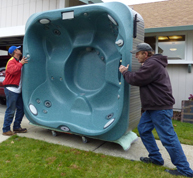 We understand the important of these items to their owners which is why for 30 years we are one of only a handful of companies in the North Bay Area that specializes in these types of items. Feel free to read our reviews online about the exceptional service we provide our customers. Peace of Mind: When it comes to planning for a move, most people become frustrated because of the stress involved. However, professional movers have a good understanding of the best way to navigate the process and also handle your specialty items thereby keeping them safe and well protected. Thus, when you know your specialty items are in safe hands, you will have peace of mind while the moving will be done perfectly and efficiently. Reliability: A professional moving company will definitely have the most reliable option because of the many years of experience, rather than using trial and error method while moving with friends and family members. The professional movers likewise undergo rigorous training so as to learn the best moving approach thereby keeping your specialty items safe during the move. Accountability: A professional moving company will be held accountable for your move and will likewise work so as to ensure all your belongings arrive at your desired location in safe condition. However, if you relocate without the help of a reputable moving company, you will have to oversee all your belongings which can result into added stress during the moving process. Fast: A moving company will be able to provide the entire details of the move so that you will know the date and time when your possessions will be picked up and deliver to the new location. Moving companies take pride in a professional and prompt service and by finding the right moving company you can ensure the safety of your specialty items. Efficient: A specialty moving company will be more efficient when it comes to handling specialty and bulky items such as pianos, pool tables, hot tubs, bath tubs, sculptures, safes, large furniture and more during the moving process. No Heavy Lifting: Without a proper training, heavy lifting can result into back strain as well as other bodily injury. You can avoid all heavy lifting during your move by hiring a professional moving company. Professional Inventory process: It can be challenging to take inventory of all the items in your home but a professional moving company can easily handle this for you. This will give you assurance that all your belongings arrive safely to your new destination without spending lot of time tracking each individual box or various specialty items during the move. Safety of Items: The use of a specialty moving company will result into a faster moving process. Movers who are experienced understand how to transport various specialty items appropriately and handle fragile items as well. They would also use appropriate materials so as to eliminate any form of damage when moving the items. Well-experienced: The level of experience is very essential during a move, an experienced mover will be able to address any concerns your have and also provide a fast, safe as well as efficient moving experience for you. Make sure you read reviews and check references. Stress Free: The use of professionals for moving won’t require any form of stress thereby ensuring you have a proper move within the shortest possible period. You can also be assured that with a professional moving company, they are licensed, bonded and insured. 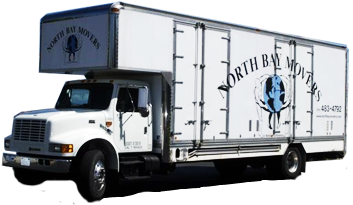 If you are considering the best company to move your specialty items, North Bay Movers is the best choice because we have more than 30 years of experience in moving specialty items. You can contact us or visit us at https://www.northbaymovers.com/specialized-items/ for more information about our services.